The Presidency has appealed to the Senate to lift the embargo placed on the screening and confirmation of nominees submitted to the Red Chamber for approval since 2017. The Presidency has urged the Senate to lift the ban on the confirmation of nominees of President Muhammadu Buhari pending before it. The presidential Adviser on National Assembly (Senate), Senator Ita Enang made the plea during the screening of two nominees for deputy governors of the Central Bank of Nigeria (CBN) and four members of the Monetary Policy Committee (MPC). The Senate had in 2017, placed an embargo on confirmation of nominees of the President not captured in the Constitution. The embargo followed a remark by Vice President Yemi Osinbajo on confirmation of the acting chairman of the Economic and Financial Crimes Commission (EFCC), Ibrahim Magu. Until last week when the Senate lifted the ban on the confirmation of the CBN nominees, over 40 appointees of the President were awaiting Senate confirmation. 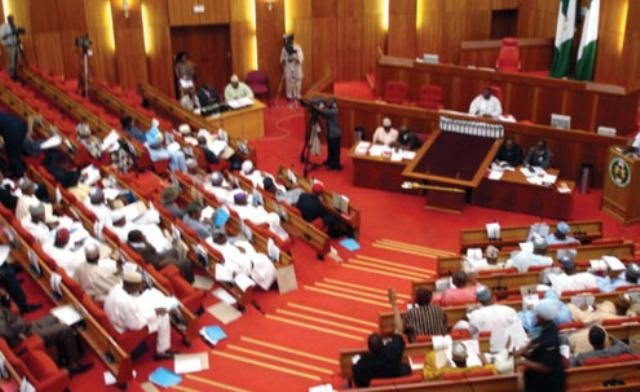 Enang told members of the Senate committee on Banking, Insurance and other financial institutions chaired by Senator Rafiu Ibrahim (APC, Kwara) to prevail on their colleagues to extend similar gesture to other nominees of the president. However, the Chairman of the Committee, Senator Rafiu Adebayo Ibrahim, immediately interjected Buhari’s Special Assistant, explaining that the gesture given to the CBN nominees was a special one in view of economic implications. Ibrahim noted that the non-confirmation of the members of the MPC by the Senate is endangering the economy of the country, adding that the failure of the Senate to confirm prevented the MPC meeting of the CBN to hold in January and on March 19, 2018. Those who were screened are Aisha Ahmad (Deputy Governor), Edward Adamu (Deputy Governor) and four members of the MPC namely Professor Adeola Festus Adenikinju; Dr Aliyu Rafindadi Sanusi; Dr Robert Chikwendu Asogwa and Dr Asheikh A. Maidugu.